Perhaps it comes with becoming an old man, but in quiet times with God I find myself in the pages of the Old Testament more often than the New. I admit more than a little unease about this. Jesus and the coming of God’s salvation to a fallen world are in the comforting words of the New Testament, the backbone of Christianity. But in spite of that, the Old Testament is where I find myself wandering off to, where I find my willful human interest taking me at this time in my life. It may simply be my fascination with ancient history taking me into its winding passages, or perhaps the ambiguity of its narratives appealing to my all too human desire to find my own answers, excuses for my own questionable thoughts and behaviors. In response to that disquiet, I remind myself that the Old Testament is a picture of God Himself. The New Testament speaks clearly of God’s love for us. We are to call God, “Abba”, the Aramaic word for “Daddy”. As a man with many decades under my belt, I have been blessed in my life for I know fatherhood. I had a human father, a father I spent uncounted hours with. I was, am, a father. Watching my children parent their own kids, I can remember them in my minds eye running toward me calling out “Daddy”! Does life give us any sweeter memory? If only I had savored that time as it deserved. But along with the good, I remember how many times I fell short, when I failed at fatherhood. Fathers are different than mothers. Smirking aside and from my own skewed perspective, God doesn’t give fathers the same basic instincts he gives mothers. Mothers just seem to know what fathers have to learn, often painfully and over many years of time. Of course our hearts melt and we swoop them up into our arms when that little bundle of flesh calls out “Daddy”! But what about being a good father? We are responsible for guiding this little person through the trials maturing them into responsible adults, but it is a daunting task. Children are different and situations are different. What’s right for one child in one situation is exactly the wrong thing for another child in a different situation? How do fathers know what to do? It is in the Old Testament that we see how the perfect father’s love works itself out in the lives of his children. 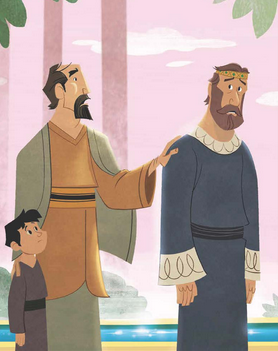 The Old Testament is a series of stories about children and their father. It is a story about a lot of different children in a lot of different situations, but all with the same father. Sometimes he is loving and forgiving to a fault, sometimes he is harsh and demanding and sometimes he seems very unfair. But we struggle with these stories knowing that he loves them and is doing what’s best for them. He is being a good father. The men who wrote the New Testament knew Jesus. They talked with the incarnate Son of God, touched him, received instruction from him. Some of them even knew Jesus as a little boy, growing up with him, perhaps playing pranks on him or even with him. By contrast, the Old Testament was written by and is about people groping in the dark, trying to please an unseen Father, a situation all too familiar to me. My own life does not seem to be the stuff of a Sunday School lesson with clear rights and wrongs. My life often seems a blind stumbling about in the grey mist, seeking to do right but often missing badly, unsure even of what is right and what is wrong. How many times have I despaired of this stumbling about and wanted a sign from God? Just tell me what you want me to do! Do this! Do that! This is what I want from you! Instead there is only the silent emptiness, an inscrutable silence that leaves me second-guessing myself. God, if only you would give me a sign. It is times like these that the Old Testament speaks and comforts. A sign from God, what Christian hasn’t wanted one? In the Old Testament we have Moses and the burning bush, Ezekiel calling down fire on the prophets of Baal, a still small voice waking Samuel. But in the Book of Isaiah we have an unusual story, an encounter with a man who didn’t want a sign from God. 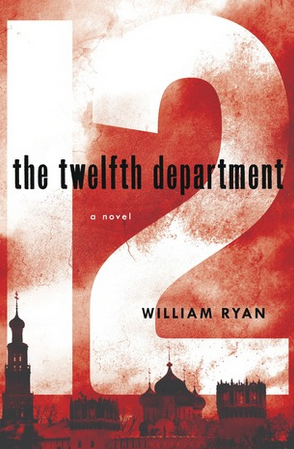 The 7th chapter tells of an encounter between two men, one delivering a message and the other to hear it. As you might guess, one of the men is Isaiah himself, one of the greatest prophets of ancient Israel. 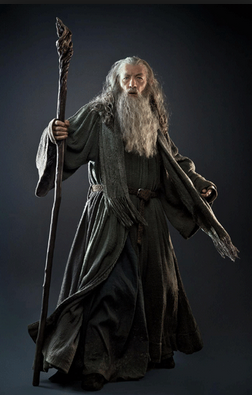 Thinking of Isaiah, I imagine Isaiah as an old man, perhaps as Tolkien’s Gandalf. I see Ian McKellen in my mind’s eye, flowing robe, white haired and spiked beard with staff in hand calling down the fury of God with outstretched finger. But instead at the time of this meeting, Isaiah is a young man, perhaps Jimmy Stewart in “It’s a Wonderful Life”. He comes to the meeting, trailing his young son, no more than five years old. The other man in the encounter, the one for whom the message is intended, is the king of Judah, Ahaz. Ahaz is also a fairly young man, perhaps twenty-five years old. Young men with power are volatile, one moment bold with the brazen confidence of youth, the next unsteady, indecisive and suspicious, unsure of whom to trust for counsel. The fate of Judah and its people are on the table. The time of the encounter is around 735 BC, 2,750 years ago. It is a time of bitter political strife, perhaps not so different from the divisions in our own country today. The nation of Israel, the kingdom of David and Solomon, had split two centuries before the time of Isaiah and this meeting. After the reign of Solomon, Israel had split in two. The northern part that seceded is now called Samaria while the southern kingdom, still ruled from Jerusalem, is known as Judah. Syria is to the north and east of Israel’s borders and it is a larger kingdom than either Judah or Samaria. But all three kingdoms, Judah, Samaria and Syria, are threatened by the emerging super power in the Middle East, Assyria. Assyria covered much of modern day Iraq and Iran, with southern Turkey and northeastern Syria thrown in as well. Assyria is on the move. Tiglath-Pileser, the third Assyrian king of that name, is on the throne. History will rank him as one of the greatest of Assyria’s rulers. Assyria’s armies are engaged in a series of conquests across the Middle East. Everyone, Samarian, Syrian and Judean, is frightened and rightly so. Assyria’s reputation for sadistic violence and bloodshed shakes us even 2,750 years later. Excavated monuments from this time period, in the words of the Assyrians themselves, speak of “flaying the skins from those who fought them” and “burning their adolescent boys and girls”. The Assyrians were scary people, no doubt about it. Syria and Samaria, nominally enemies of each other, had pledged alliance, joining together to resist Assyria. They are now demanding Judah join with them. In light of other accounts, we are left to wonder what such an alliance meant. Peering into the mists of biblical accounts that reveal with an obscure light, we can infer that Judah at this time was weak because of internal conflicts. Ahaz was king of Judah, but his father Jotham was also king during the first four years of his reign. A throne shared by two men is a nation split, torn by politics and easily taken advantage of by outside powers. It is around the time of this meeting between Isaiah and Ahaz that Jotham disappears from the record without note, leaving Ahaz to rule Judah alone. Was Jotham taken by natural causes or was his blood spilled in a palace coup? The Bible is silent about how and why Jotham exits. But Isaiah’s meeting with Ahaz implies that Jotham is gone or no longer matters. But it is good to remember that the nation, Judah, is still torn internally, scores are being settled and perhaps Ahaz’s hands are still dripping with his father’s blood as Isaiah and his young son meet him. It is a time of crisis. Powerful factions within Judah are maneuvering, seeking advantage, as the Jotham/Ahaz power struggle plays out against the looming menace of Assyria. Fox News is in its element as the different players in Judean politics come in and go out of the palace. It is now in the middle of this breaking news story, this political drama in Jerusalem, that envoys from Samaria and Syria arrive at the palace in Jerusalem. Given the ways of power in that time, these envoys did not arrive in black limousines, but escorted by flying columns of heavy cavalry, a very visible manifestation of power. Their message to Ahaz is simple; are you for us or against us? Given the situation their message is probably not “join us”, but “accept our terms” – submit to us, give us money and men to fight the Assyrians. 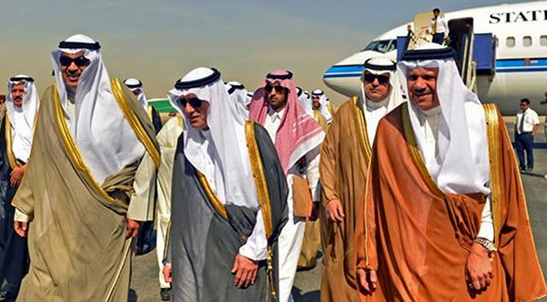 If you don’t accept our terms, we will kill you and make “the son of Tabeel” king of Judah in your place. From a strategic perspective, from a human perspective, we can understand Samaria and Syria’s position. They must defend themselves from the looming invading Assyrian armies. Judah borders Syria and Samaria on the south. If Judah comes under Assyria’s wing, as in fact happens, Syria and Samaria must defend themselves on both the south and north. It is as if armies invading the United States came from both Mexico and Canada. Was this a credible threat to Ahaz or empty bluster? What did the people of Judah think about this threat? Were they at all loyal to Ahaz? Who was this “son of Tabeel”? We have no answers to those questions. The Bible simply tells us “Ahaz and the hearts of his people shook as the trees of the forest shake with the wind”. And remember that it was only the threat of Syria and Samaria making the courage of Ahaz’s people run like water. The Assyrians were much much much worse. And so Ahaz is in a hard place with only bad choices and the buck stops here. He can voluntarily join in alliance with Syria and Samaria to fight Assyria, a junior partner at best, cannon fodder more likely. 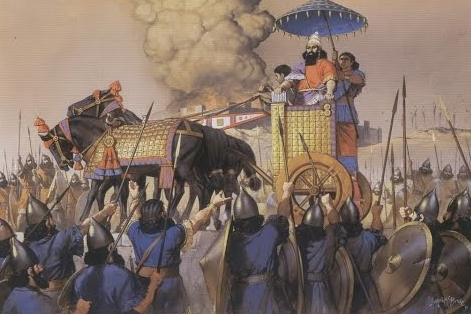 But even so, can the three small kingdoms really resist Tiglath-Pileser and the all-conquering Assyrian armies? Allying himself and Judah with Syria and Samaria looks like a period of humiliating servitude, followed by the gut-wrenching prospect of watching his young sons and daughters perish screaming in flames, living sacrifices to Ishtar patron goddess of Ninevah. His wives would no doubt become the trophies of Tiglath Pileser’s favored commanders. After these horrors, then Ahaz would make the long march to Ninevah in the chains of the Assyrian army followed by being skinned alive in another public ceremony demonstrating the awesome power of Tiglath Pileser. On the other hand, Ahaz can refuse the ultimatum from Syria and Samaria. Perhaps Judah can remain neutral in the coming Assyrian invasion. Perhaps Judah could buy off Assyria. But why would Assyria stop after conquering Syria and Samaria? Judah is simply another bite of the apple. Even so, would it make any difference to Ahaz himself? Or his kingdom? Syria & Samaria had threatened in a very credible way. Their armies were massing on the border. Ahaz would in all likelihood be dead, “the son of Tabeel” would be king and Judah would be a carcass torn at by wolves. What to do? What to do? It is here that God intervenes. God instructs his prophet, Isaiah, to seek out Ahaz and deliver a message. Isaiah obeys, meeting Ahaz face to face out in the open, away from the pomp and circumstance of the palace. We are told that Isaiah, his young son and Ahaz are there. Were there more people there? We don’t know. It is hard to imagine that Ahaz didn’t have advisors, an entourage, guards with him, but the Book of Isaiah is silent on the matter. Much of the Book of Isaiah is poetry, the work of a poet the equal in eloquence to Homer. And so we hear God’s message to Ahaz, relayed by his prophet Isaiah, compressed into a few lines of poetry. Paraphrased, the message directs Ahaz to ignore the threats of Syria, ignore Samaria. These ephemeral earthly powers are of no account and soon will be barren wastelands. Stand fast, Ahaz, trust in me and I, the God of Israel, will protect you. You, Ahaz, are David’s heir to whom I promised an eternal kingdom, while these kings of Samaria and Syria are simply ruffians who will vanish and not be heard of again. Stay calm, trust in me and everything will be fine. On the other hand, if you ignore my message, things will go badly with you and your kingdom. I suspect that this is the short and edited version of the actual conversation. Does one enter into a conversation, speaking the elegant poetry of metaphor and allusion to a king without at least saying hello? Poetry is really hard to understand the first time through, even when one can read it at leisure. Would Ahaz even have understood Isaiah’s words as written in the Book of Isaiah? I am speculating, but I suspect Isaiah and Ahaz had a more prosaic conversation about the whole Syria/Samaria/Assyria affair. But I also have no doubt that the Book of Isaiah’s poetry conveys the truth of their conversation. God is no stranger to our lack of faith. While we are not told what Ahaz’s response to Isaiah’s words was, God did not need his words because he knew the heart of Ahaz, spoken or unspoken. And so after the words of Isaiah, the text tells us that God speaks to Ahaz again. How much time passes? Does God speak directly to Ahaz, or are these the words of Isaiah speaking for God? We don’t know, but the meaning is clear. This is a serious offer. How many times faced with tough choices have we asked for a sign? What would we do, if in the midst of our deepest trials God came to us with clear direction, offering to do a bit of magic just to prove the message was really from God? Even more, remember Ahaz is a Jew living in ancient Israel. Ahaz has grown up with stories of signs and wonders done by God for Abraham, for Moses, for Noah, for Samson and Gideon. King David is this man’s many times great grandfather. Even closer to home is a man Ahaz knew intimately, his grandfather Uzziah. Uzziah was a righteous king of Judah, reigning for fifty-two years. Uzziah had enjoyed great success and God’s favor, but in so doing had become proud. 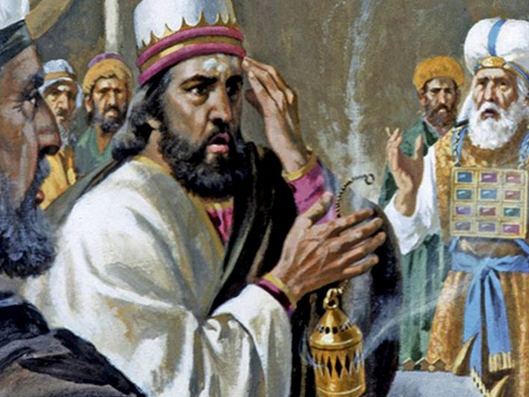 Acting out of the pride in his heart, Uzziah began to perform acts of worship in God’s temple reserved for the priests, the very sin that had been the downfall of Israel’s first king, Saul. In the very midst of Uzziah’s prideful act, God had struck him down with leprosy. His grandfather a righteous man struck down with a terrible disease, Ahaz knows himself no match for his grandfather in righteousness. What might God have in store for Ahaz? This is a table stakes game with everything on the table. This is the acid test. It is worth pondering in our own heart. What would we do? 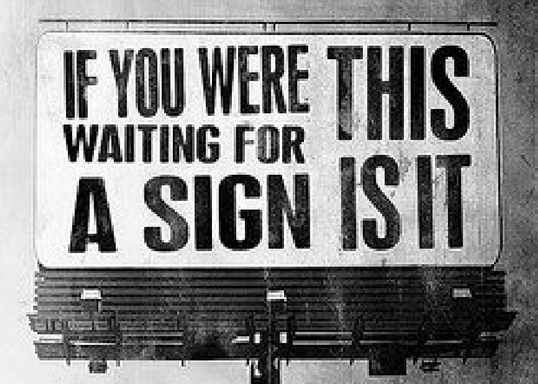 When we ask for a sign from God, do we really want one? Power, real power unconstrained by custom or law, is frightening. Job, who knew well of what he spoke, told us that “he is terrified of God’s presence”. In the presence of omnipotence, I cannot fool myself, I can only cower hoping that I will not be seen. There is no safe harbor in the presence of God. Anything can happen, literally anything, and that is a terrifying prospect. And so Ahaz does what many of us do in tough situations, he punts. He seeks to hide behind pious language. “O house of David!” Instead of his name, God uses a metaphor common in the Bible for his people, house of David. By this God tells Ahaz that his refusal is not just for himself, but for his nation as well. In Ahaz’s insolence Ahaz is speaking for his nation, Judah. God is angry with them all, angry at their lack of faith. God tells Ahaz that a child will be born soon. Before this child, the child born of a virgin, is old enough to choose right from wrong, Samaria and Syria will be laid waste. The kings of these two kingdoms, which so terrify Ahaz and his people, will be gone as if they never lived. God also knows that Ahaz has made a decision. Ahaz has it in his heart to try and make a deal. He will run to the Assyrians, offering bribes to make them leave Judah alone. God goes on to tell Ahaz that this deal will not spare them great hardship. Not only Assyria, Syria and Samaria, but enemies from the south such as Edom and Egypt, will rage through Judah such that his own kingdom will be a place for “pasturing oxen and for sheep to trample”. Perhaps Ahaz will save his life and even remain king, but he will reign over a wasteland. The meeting is over. We are told no more. Does Ahaz slap Isaiah, have him beaten for daring to speak to the king this way? Does Ahaz simply shrug his shoulders and walk away? Perhaps sometime in eternity future I will hear Isaiah tell “the rest of the story”. But we do know what Ahaz did do. Ahaz did not put his trust in God’s protection, but instead took his treasure, including the gold and silver objects from the Temple, and sent them to Tiglath-Pileser as a bribe, seeking Assyria’s protection. But first before Assyria could respond to Ahaz’s bribe and as God had warned, Samaria and then Syria savagely attacked Judah seeking to secure their southern borders before the Assyrian onslaught. The Books of II Kings and II Chronicles tell us that hundreds of thousands in Judah were killed and hundreds of thousands more carried off into slavery. But as Isaiah’s prophecy had foretold, Samaria and Syria were ravaged and conquered in their turn by Assyria, their kings gone as if they had never been. Tiglath-Pileser stopped short of conquering Judah as well, but he treated Judah roughly despite Ahaz’s bribes and as God had warned, ravaging parts of the kingdom taking spoils and slaves as he willed. But Tiglath-Pileser’s alliance had come with an even steeper price. Judah was no longer an independent kingdom. Ahaz remained as king only because Tiglath-Pileser allowed it. Judah was now a province of the Assyrian Empire. Judah would never be an independent kingdom again, but only a province in a succession of empires. Judah was now a province of Assyria, then of Babylon, then of Persia, then of the Selucids and then of Rome in the time of Jesus. And so we leave the account in the 7th chapter of Isaiah. But we are left with the prophecy delivered through Isaiah to Ahaz, “Behold a virgin will be with child and bear a son and she will call his name Immanuel.” We have heard those words again and again. There is resonance in them and there is promise. Those few words echo in our minds because there was a virgin, a virgin with child, some seven plus centuries later. 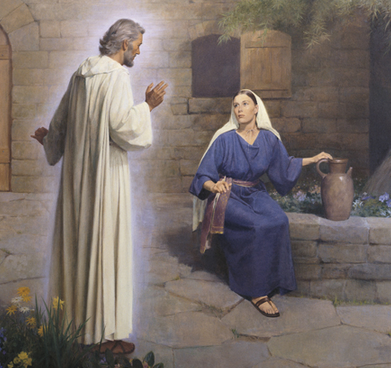 This virgin, named Mary, bore a son named Jesus, a son whose father was God himself. The name prophesied by Isaiah, Immanuel, means – “God with us”, a name fulfilled with the birth of Jesus. Isaiah’s prophesy of a pregnant virgin is a contentious one. Academics seeking to remove God from human history have descended on this prophesy like crows on road kill. In Isaiah, the Hebrew word being translated as “virgin” does not necessarily mean virgin. Instead the Hebrew language of Isaiah uses a synonym for virgin, the word almah, defined as– “a young woman of childbearing age who had not yet given birth”. In cultures and times other than our own, this might be a distinction of small differences. But in our own culture and time this cannot help but invite question. But we are left to wonder about the intervening centuries between the meeting with Ahaz and the birth of Christ. Out of all that was said and done in Isaiah’s ministry, this prophesy of a pregnant virgin was included in Scripture, either by Isaiah himself or by his followers. Why was this here? What would the Jewish rabbi’s over those seven plus centuries have thought it meant? How did they handle it in their commentaries? The prophesy of a virgin with child is unusual in that it contains a ticking clock. The prophesied destruction of Samaria and Syria, as well as in Judah, will happen before that child born of a virgin is able to choose right from wrong. Indeed it did happen in that time span just as prophesied by Isaiah, with Samaria and Syria swept by the Assyrian armies and Judah devastated. But what of this child born of a virgin? What is a Jew of a later time to think? Modern Jews argue that the word “almah” only means young unmarried woman, having nothing to do with the woman’s sexual/maternal status. Unfortunately neither Webster nor Oxford did a Hebrew dictionary in 735 BC and we are left with musings of scholars seeking either tenure or notoriety. The fine distinctions of word meanings thousands of years ago are lost in the mists of time. We only know what we know. But I am struck how modern Jewish explanation of this prophecy so closely mirrors that king of 2,750 years ago. Ahaz also chose to ignore God’s revelation. And so for seven hundred years this prophecy was part of the Jewish Bible. It is worth noting that four hundred years after the time of Isaiah the Seleucid Greeks so thoroughly dominated the Middle East that Greek became the common language of everyone. At that time the Jews translated their scriptures into Greek, as the original languages of Hebrew and Aramaic were little used. This version of the Old Testament, known as the Septuagint, used the word, parthenos, whose definition is – “virgin”. In passing it should be said that the Septuagint translation predates Christ by some two centuries. But it must also be noted that the oldest copies of the Septuagint in our possession date to a few centuries after the birth of Christ. If the Septuagint of 200 BC used a word other than parthenos for this prophecy, we don’t know. Does it really matter? One of the attacks on our faith, one of the doubts we have if we are honest with ourselves, is how do we know that our Bible is accurate? How do we know that its words have come to us unchanged over tens of centuries? We don’t. In Christianity, one of the hard things we have to come to terms with is that we can’t prove our faith. Faith in God, belief in the salvation offered by his Son – Jesus Christ, requires belief. It cannot be proven, only taken on faith.